The form that follows is for a retail copy and duplication operation located on the ground floor of a downtown office building. The tenant pays fixed base rent and its prorata share of operating costs and taxes, but does not have to pay percentage rent. 3.1. ORIGINAL TERM: RENT COMMENCEMENT DATE. This Lease shall be for a term (the "ORIGINAL TERM") commencing on the Effective Date and ending at 11:59 p.m. on the __________ (___) anniversary of the first day of the month, in which the Rent Commencement Date shall occur (which date is hereinafter referred to as the "TERMINATION DATE"). Monthly rent payments and additional rent shall commence on _____________ (which date is hereinafter referred to as the "RENT COMMENCEMENT DATE"). 3.2. CONFIRMATION OF COMMENCEMENT AND TERMINATION. The Landlord and the Tenant at the Landlord's option and request after (a) the Rent Commencement Date or (b) the expiration of the Term or any earlier termination of this Lease by action of law or in any other manner, shall confirm in writing by instrument in recordable form that, respectively, such rent commencement or such termination has occurred, setting forth therein, respectively, the Rent Commencement Date and the Termination Date. 3.3. SURRENDER. The Tenant, at its expense at the expiration of the Term or any earlier termination of this Lease, shall (a) promptly surrender to the Landlord possession of the Premises (including any fixtures or other improvements which are owned by the Landlord) in good order and repair (ordinary wear and tear excepted) and broom clean, (b) remove therefrom all signs, goods, effects, machinery, fixtures and equipment used in conducting the Tenant's trade or business which are neither part of the Building Service Equipment nor owned by the Landlord, and (c) repair any damage caused by such removal. (c) except as provided herein, such month-to-month tenancy shall be on the same terms and subject to the same conditions as those set forth in this Lease; provided, however, that if the Landlord gives the Tenant, at least one month before the end of any calendar month during such month-to-month tenancy, written notice that such terms and conditions (including any thereof relating to the amount and payment of Rent) shall, after such month, be modified in any manner specified in such notice, then such tenancy shall, after such month, be upon the said terms and subject to the said conditions, as so modified. 4.2. ADDITIONAL RENT. Additional rent ("ADDITIONAL RENT") shall include any and all charges or other amounts which the Tenant is obligated to pay to the Landlord under this Lease, other than the Base Rent. 4.3.1. COMPUTATION. Within one hundred twenty (120) days after the end of each calendar year during the Term, the Landlord shall compute the total of the Operating Costs incurred for the Property during such calendar year, and the Landlord shall allocate them to each separate rentable space within the Property in proportion to the respective operating costs percentages assigned to such spaces; provided that anything in this subsection 4.3 to the contrary notwithstanding, whenever the Tenant and/or any other tenant of space within the Property has agreed in its lease or otherwise to provide any item of such services partially or entirely at its own expense, or wherever in the Landlord's sole judgment any such significant item of expense is not incurred with respect to or for the benefit of all of the net rentable space within the Building (including but not limited to any such expense which, by its nature, is incurred only with respect to those spaces which are occupied), in allocating the Operating Costs pursuant to this subsection, the Landlord shall make an appropriate adjustment, using generally accepted accounting principles, as aforesaid, so as to avoid allocating to the Tenant or to such other tenant (as the case may be) those Operating Costs covering such services already being provided by the Tenant or by such other tenant at its own expense, or to avoid allocating to all of the net rentable space within the Building those Operating Costs incurred only with respect to a portion thereof, as aforesaid. The Tenant shall have the right, during normal business hours at the Landlord's offices, to review the books and records of the Landlord with respect to the calculation of Operating Costs for the prior Lease Year, at the Tenant's sole expense, provided (i) the Tenant provides at least fifteen (15) days' advance written notice to the Landlord of its desire to inspect such books and records, and (ii) such request is made within sixty (60) days after the Operating Costs Statement is delivered by the Landlord to the Tenant. If the Tenant does not notify the Landlord within such 60-day period, then all sums included as Operating Costs shall be deemed acceptable to the Tenant and thereafter the Tenant shall have no right to dispute in any manner any sums included within Operating Costs for such prior Lease Year. Landlord shall exclude the following items from the calculation of Operating Costs: janitorial services and building security. 4.3.2. PAYMENT AS ADDITIONAL RENT. Within fifteen (15) days after demand therefor by the Landlord (with respect to each calendar year during the Term), accompanied by a statement setting forth the Operating Costs for such calendar year (the "OPERATING COSTS STATEMENT"), the Tenant shall pay to the Landlord, as Additional Rent, the amount equaling Tenant's Proportionate Share of the Operating Costs for such calendar year. In addition to the Base Rent, Tenant shall pay on a monthly basis, an estimated payment towards its obligation for Operating Costs. The monthly payments shall be __________________ dollars ($_____) per month. 4.3.3. PRORATION. If only part of any calendar year falls within the Term, the amount computed as Additional Rent for such calendar year under this subsection shall be prorated in proportion to the portion of such calendar year falling within the Term (but the expiration of the Term before the end of a calendar year shall not impair the Tenant's obligation hereunder to pay such prorated portion of such Additional Rent for that portion of such calendar year falling within the Term, which amount shall be paid on demand, as aforesaid). 4.3.4. LANDLORD'S RIGHT TO ESTIMATE. Anything in this subsection to the contrary notwithstanding, the Landlord, at its reasonable discretion, may (a) make from time to time during the Term a reasonable estimate of the Additional Rent which may become due under this subsection for any calendar year, (b) require the Tenant to pay to the Landlord for each calendar month during such year one twelfth (1/12) of such Additional Rent, at the time and in the manner that the Tenant is required hereunder to pay the monthly installment of the Base Rent for such month, and (c) increase or decrease from time to time during such calendar year the amount initially so estimated for such calendar year, all by giving the Tenant written notice thereof, accompanied by a schedule setting forth in reasonable detail the expenses comprising the Operating Costs, as so estimated. In such event, the Landlord shall cause the actual amount of such Additional Rent to be computed and certified to the Tenant within one hundred twenty (120) days after the end of such calendar year. Any overpayment or deficiency in the Tenant's payment of Tenant's Proportionate Share of Operating Costs shall be adjusted between the Landlord and the Tenant; the Tenant shall pay the Landlord or the Landlord shall credit to the Tenant's account (or, if such adjustment is at the end of the Term, the Landlord shall pay to the Tenant), as the case may be, within fifteen (15) days after such notice to the Tenant, such amount necessary to effect such adjustment. The Landlord's failure to provide such notice within the time prescribed above shall not relieve the Tenant of any of its obligations hereunder. 4.4. WHEN DUE AND PAYABLE. 4.4.1. BASE RENT. The Base Rent for any Lease Year shall be due and payable in twelve (12) consecutive, equal monthly installments, in advance, on the first (1st) day of each calendar month during such Lease Year. In addition, the Base Rent for the first full calendar month shall be due and payable upon execution of the Lease. Rent for any partial calendar month shall be due and payable five (5) days after the Rent Commencement Date. 4.4.2. ADDITIONAL RENT. Any Additional Rent accruing to the Landlord under this Lease, except as is otherwise set forth herein, shall be due and payable when the installment of Base Rent next falling due after such Additional Rent accrues and becomes due and payable, unless the Landlord makes written demand upon the Tenant for payment thereof at any earlier time, in which event such Additional Rent shall be due and payable at such time. 4.4.3. NO SET-OFF; LATE PAYMENT. Each such payment shall be made promptly when due, without any deduction or setoff whatsoever, and without demand, failing which the Tenant shall pay to the Landlord as Additional Rent, after the fifth (5th) day after such payment remains due but unpaid, a late charge equal to five percent (5%) of such payment which remains due but unpaid. In addition, any payment that is not paid by the tenth (10th) day after such payment is due shall bear interest at the rate of twelve percent (12%) per annum. Any payment made by the Tenant to the Landlord on account of Rent may be credited by the Landlord to the payment of any Rent then past due before being credited to Rent currently falling due. Any such payment which is less than the amount of Rent then due shall constitute a payment made on account thereof, the parties hereto hereby agreeing that the Landlord's acceptance of such payment (whether or not with or accompanied by an endorsement or statement that such lesser amount or the Landlord's acceptance thereof constitutes payment in full of the amount of Rent then due) shall not alter or impair the Landlord's rights hereunder to be paid all of such amount then due, or in any other respect. 4.5. WHERE PAYABLE. The Tenant shall pay the Rent, in lawful currency of the United States of America, to the Landlord by delivering or mailing it to the Landlord's address which is set forth in section 20, or to such other address or in such other manner as the Landlord from time to time specifies by written notice to the Tenant. 4.6 TAX ON LEASE. 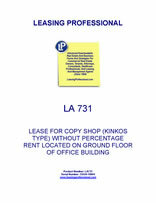 If federal, state or local law now or hereafter imposes any tax, assessment, levy or other charge directly or indirectly upon (a) the Landlord with respect to this Lease or the value thereof, (b) the Tenant's use or occupancy of the Premises, (c) the Base Rent, Additional Rent or any other sum payable under this Lease, or (d) this transaction, then the Tenant shall pay the amount thereof as Additional Rent to the Landlord upon demand, unless the Tenant is prohibited by law from doing so, in which event the Landlord at its election may terminate this Lease by giving written notice thereof to the Tenant. 6. USE OF PREMISES AND COMMON AREAS. 6.1 NATURE OF USE. The Tenant shall use the Premises only for general offices, storage and photo copy shop open to the general public. (f) be responsible for the security of the Premises. With respect to The Americans with Disabilities Act and the ADA Disability Guidelines thereto, the Tenant shall be responsible for the entire Premises, including all entry doors and signage (subject, however, to the provisions of subsection 10.2), and the Landlord shall be responsible for the Building and the Common Areas. 6.3.1. Without limiting the generality of the foregoing provisions of this section, the Tenant shall not create or permit to be created, and if created shall discharge or have released, any mechanics' or materialmens' lien arising while this Lease is in effect and affecting any or all of the Premises, the Building and/or the Property, and the Tenant shall not permit any other matter or thing whereby the Landlord's estate, right and interest in any or all of the Premises, the Building and/or the Property might be impaired. The Tenant shall defend, indemnify and hold harmless the Landlord against and from any and all liability, claim of liability or expense (including but not limited to that of reasonable attorneys' fees) incurred by the Landlord on account of any such lien or claim. Landlord for any amount paid by the Landlord to discharge any such lien and all expenses incurred by the Landlord in connection therewith, together with interest thereon at the rate of twenty percent (20%) per annum from the respective dates of the Landlord's making such payments or incurring such expenses (all of which shall constitute Additional Rent). 6.3.3. Nothing in this Lease shall be deemed in any way (a) to constitute the Landlord's consent or request, express or implied, that any contractor, subcontractor, laborer or materialmen provide any labor or materials for any alteration, addition, improvement or repair to any or all of the Premises, the Building and/or the Property, or (b) to give the Tenant any right, power or authority to contact for or permit to be furnished any service or materials, if doing so would give rise to the filing of any mechanics' or materialmens' lien against any or all of the Premises, the Building and/or the Property, or the Landlord's estate or interest therein, or (c) to evidence the Landlord's consent that the Premises, the Building and/or the Property be subjected to any such lien. 6.4. SIGNS. The Tenant shall have no right to erect signs upon the Premises or the remainder of the Building or the Property unless the Landlord has given its express, written consent thereto, which consent shall not be unreasonably withheld. Tenant shall be permitted to place its business name on the front of the Premises and/or the glass portion of the entry door to the Premises. Tenant's sign is subject to Landlord's approval. 6.5.1. GRANT OF LICENSE. The Landlord hereby grants to the Tenant a non-exclusive license to use (and to permit its officers, directors, agents, employees and invitees to use), in the course of conducting business at the Premises, those areas and facilities of the Property which may be designated by the Landlord from time to time as common areas (portions of which may from time to time be relocated and/or reconfigured by the Landlord in its sole discretion so long as reasonable access to and from the Premises is maintained) (the "COMMON AREAS"), which Common Areas include footways, sidewalks, Parking Areas, lobbies, elevators, stairwells, corridors, restrooms and certain exterior areas on the Property, subject, however, to the Rules and Regulations. "PARKING AREAS" shall mean those portions of the Common Areas which from time to time are designated by the Landlord for the parking of the automobiles and other automotive vehicles while engaged in business upon the Premises (other than while being used to make deliveries to and from the Premises). The Landlord hereby reserves the right to determine the hours during which tenants may use lobbies, elevators, stairwells, corridors and the like. 6.5.2. NON-EXCLUSIVE LICENSE. Such license shall be exercised in common with exercise thereof by the Landlord, the other tenants or occupants of the Property, and their respective officers, directors, agents, employees and invitees. 6.5.3. PARKING AREAS; CHANGES. The Landlord reserves the right to change the entrances, exits, traffic lanes, boundaries and locations of the Parking Areas, if applicable. All Parking Areas and facilities which may be furnished by the Landlord in or near the Property, including any employee parking areas, truckways, loading docks, pedestrian sidewalks and ramps, landscaped areas and other areas and improvements which may be provided by the Landlord for the Tenant's exclusive use or for general use, in common with other tenants, their officers agents, employees and visitors, shall at all times be subject to the Landlord's exclusive control and management, and the Landlord shall have the right from time to time to establish, modify and enforce reasonable rules and regulations with respect thereto. The Landlord shall have the right to (a) police the Common Areas, (b) establish and from time to time to change the level of parking surfaces, (c) close all or any portion of the Common Areas to such extent as, in the opinion of the Landlord's counsel, may be legally sufficient to prevent a dedication thereof or the accrual of any rights to any person or to the public therein, (d) close temporarily all or any portion of the Parking Areas, (e) discourage non-tenant parking, and (f) do and perform such other acts in and to the Common Areas as, in the use of good business judgment, the Landlord determines to be advisable with a view to the improvement of the convenience and use thereof by tenants, their officers, agents, employees and visitors. The Tenant shall cause its officers, agents and employees to park their automobiles only in such areas as the Landlord from time to time may designate by written notice to the Tenant as employee parking areas, and the Tenant shall not use or permit the use of any of the Common Areas in any manner which will obstruct the driveways or throughways serving the Parking Areas or any other portion of the Common Areas allocated for the use of others. The Tenant shall not keep parked vehicles on the Parking Areas overnight. 6.5.4. ALTERATIONS. The Landlord reserves the right at any time and from time to time (i) to change or alter the location, layout, nature, or arrangement of the Common Areas or any portion thereof, including but not limited to the arrangement and/or location of entrances, passageways, doors, corridors, stairs, lavatories, elevators, parking areas, and other public areas of the Building, and (ii) to construct additional improvements on the Property and make alterations thereof or additions thereto and build additional stories on or in any such buildings adjoining the same; provided, however, that no such change or alteration shall deprive the Tenant of access to the Premises. 6.5.5. USE OF COMMON AREAS. (a) The Landlord shall at all times have full and exclusive control, management and direction of the Common Areas. Without limiting the generality of the foregoing, the Landlord shall have the right to maintain and operate lighting facilities on all of the Common Areas and to police the Common Areas. (b) The Tenant shall keep the sidewalks and service areas adjacent to the Premises swept and free from trash, rubbish, garbage and other refuse. (c) The Tenant shall maintain in a neat and clean condition that area designated by the Landlord as the refuse collection area, and shall not place or maintain anywhere within the Property, other than within the area which may be designated by the Landlord from time to time as such refuse collection area, any trash, garbage or other items, except as may otherwise be expressly permitted by this Lease; provided, however, that in the event there is no room in the refuse collection area for the Tenant's trash, the Landlord shall notify the Tenant thereof and the Tenant shall be required to make its own arrangements for the removal of its trash from the Premises. (iii) the parking or storage of any trucks or vans weighing over three-quarters (3/4) of one ton, except for purposes of temporary loading and unloading. 6.6. LIABILITY OF LANDLORD. The Landlord and its agents and employees shall not be liable to the Tenant or any other person whatsoever (a) for any injury to person or damage to property caused by any defect in or failure of equipment, pipes, wiring or broken glass, or the backing up of any drains, or by gas, water, steam, electricity or oil leaking, escaping or flowing into the Premises, or (b) for any loss or damage that may be occasioned by or through the acts or omissions of any other tenant of the Property or of any other person whatsoever, other than the gross negligence of the Landlord's duly authorized employees or agents. 6.7. FLOOR LOAD. The Tenant shall not place a load upon any floor of the Premises exceeding the floor load per square foot area which such floor was designed to carry. The Landlord reserves the right to prescribe the weight and position of all sales and other heavy equipment, and to prescribe the reinforcing necessary, if any, which in the opinion of the Landlord may be required under the circumstances, such reinforcing to be at the Tenant's sole expense. Business machines and mechanical equipment shall be placed and maintained by the Tenant in settings sufficient in the Landlord's judgment to absorb and prevent vibration and noise, and the Tenant shall, at its sole expense, take such steps as the Landlord may direct to remedy any such condition. 6.8. HAZARDOUS MATERIALS. The Tenant warrants and agrees that the Tenant shall not cause or permit any Hazardous Material to be brought upon, kept or used in or about the Premises by the Tenant, its agents, employees, contractors or invitees. If the Tenant breaches the obligations stated in the preceding sentence, then the Tenant shall indemnify, defend and hold the Landlord harmless from and against any and all claims, judgments, damages, penalties, fines, costs, liabilities or losses (including, without limitation, diminution in value of the Premises, the Building and the Property generally, damages for the loss or restriction on use of rentable or usable space or of any amenity of the Building or the Property generally, damages from any adverse impact on marketing of space in the Building, and sums paid in settlement of claims, attorneys' fees, consultant fees and expert fees) which arise during or after the Term as a result of such contamination. This indemnification of the Landlord by the Tenant includes, without limitation, costs incurred in connection with any investigation of site conditions or any cleanup, remedial, removal or restoration work required by any governmental authority because of Hazardous Material present in the soil or ground water or under the Premises or the Property generally. As used herein (i) "ENVIRONMENTAL LAWS" means the Clean Air Act, the Resource Conservation Recovery Act of 1976, the Hazardous Material Transportation Act, the Comprehensive Environmental Response, Compensation and Liability Act of 1980, the Resource Conservation and Recovery Act, the Toxic Substances Control Act, the Occupational Safety and Health Act, the Consumer Product Safety Act, the Clean Water Act, the Federal Water Pollution Control Act, the National Environmental Policy Act, as each of the foregoing shall be amended from time to time, and any similar or successor laws, federal, state or local, or any rules or regulations promulgated thereunder, and (ii) "HAZARDOUS MATERIALS" means and includes asbestos; "oil, petroleum products and their by-products" "hazardous substances;" "hazardous wastes" or "toxic substances," as those terms are used in Environmental Laws; or any substances or materials listed as hazardous or toxic in the United State Department of Transportation, or by the Environmental Protection Agency or any successor agency under any Environmental Laws.